Tubular braided sleeving meets the broad range of EMC shielding and mechanical protection requirements of aircraft harness assemblies. 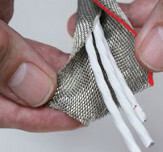 But the need to apply conductive shielding materials over installed aircraft wire and cable bundles requires new technology. 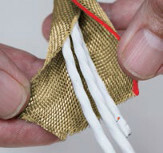 Legacy self-wrapping cable braid has long been available for EMI/RFI applications and abrasion protection, albeit with poor performance due to its heavy weight, inflexibility, and "windowing," which results in poor shielding performance. MasterWrap™, a lightweight, easy-to-install, side-entry, self-wrapping shielding solution – incorporating Glenair microfilament ArmorLite™ and composite thermoplastic PEEK fibers – solves these problems and more. 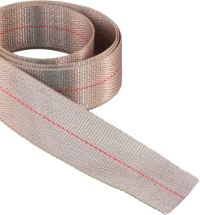 MasterWrap™ is ideally suited for both long-run wire harness protection as well as spot coverage and maintenance of EMC cable applications – all with outstanding weight reduction and ease-of-assembly. MasterWrap™ is qualified for use at major aircraft manufacturers for both long cable runs and spot coverage and repairs.